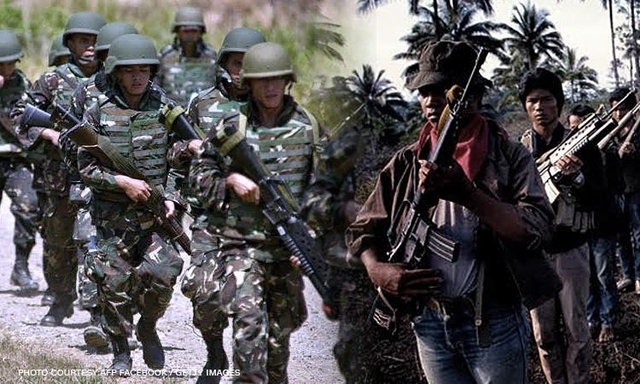 MANILA – Due to intensified security operations nationwide, the Armed Forces of the Philippines (AFP) announced that it is continuously gaining grounds against the New People's Army (NPA) and other terrorist groups. This, according to AFP public affairs office chie,f Col. Noel Detoyato, in a statement Tuesday. He said ongoing military operations against these threat groups led to the massive surrender of NPA regular members and their supporters. "Just last week, September 26, 2018, 16 communist terrorists from the NPA, including four women and two child warriors surrendered to the Philippine Army’s 53rd Infantry Battalion in Poblacion, Zamboanga Del Sur. Last Sunday, September 30, three members of Southern Mindanao Regional Command of the NPA voluntarily surrendered to the local chief executives of Barangay Lumiad, and Barangay Magsaysay, Carmen, Davao Del Norte," he said. Detoyato said a certain alias Ramo, vice commander of the Pulang Bagani Command 1, SRC5, SMRC; an alias Marvin/Isak, team leader of Andoy Primera of the same group; and an alias Joa, medic of the same group, surrendered to the government troops. "Upon their debriefing, they gave information that led to the recovery of a CAP2 landmine, a caliber .38 revolver, and 400 rounds of ammunition," he added. Meanwhile, AFP chief-of-staff, Gen. Carlito Galvez, Jr., said these surrenders highlights the lack of public support to the NPA. “Ang mga sumurender ay matataas ang katungkulan sa kanilang organisasyon, sila na din ang nagsabi na hirap na sila at wala nang nakikitang rason upang lumaban pa sa ating pamahalaan (Those who have surrendered are high ranking officials in their organizations. They admitted that they are now having a hard time and they do not see any reason to fight against the government," he said. As of Sept. 25, a total of 9,606 NPAs and their supporters, including 900 regular and 921 underground mass organization members, have voluntarily surrendered to the government. Also, 64 former NPA rebels were welcomed back to the mainstream society by Task Force Balik Loob in Nabunturan, Compostela Valley last Sept. 27 and were provided with Enhanced Comprehensive Local Integration Program (E-CLIP) benefits. Other former rebels in Southern Mindanao were also provided with livelihood and cash benefits in a program held in Nabunturan, Compostela Valley last Sept. 29. “It is not too late for you (NPAs) to surrender and leave your current miseries from fighting a useless cause," Galvez said. Meanwhile, troops of Army’s 90th Infantry Battalion on Oct. 1 foiled a bombing plot of the Bangsamoro Islamic Freedom Fighters (BIFF), after receiving a report from a concerned civilian that terrorists were planning to transport an improvised explosive device (IED). The IED was found inside a passenger jeepney during checkpoint operation in Barangay Capiton, Datu Odin Sinsuat, Maguindanao. The suspected bombers were identified as Kamsali Taguitikan and Rasol, under Karialan faction of the BIFF. The tipster claimed that the two are planning to transport the IED from the marshy area of Barangay Palongoguen in Midsayap, North Cotabato to conduct terror attack in Cotabato City. Elements of 3rd Explosive Ordnance Disposal team of the Army immediately arrived in the area and safely defused the IED. Recovered from the scene were a 81mm and an 60mm mortar shell, two batteries (dry cell), one roll electrical tape, and wires. “I commend all the troops who successfully foiled another terror attack that might have killed innocent civilians. I remind every unit and every soldier, airman, sailor, and marine not to let our guards down against terrorists," Galvez said.